Late last year, for reasons that have much to do with the fact that they were all given beautiful new designs by the good people at Penguin (the image to the right gives some idea, but doesn't really convey the shiny metallic nature of the dustjacket), I purchased a complete set of F. Scott Fitzgerald's books: four novels, one unfinished one, and a collection of his short stories. At that point, a many-years-ago reading of The Great Gatsby was the extent of my Fitzgerald-readership, so I thought I would read them all, in order, and briefly review them. 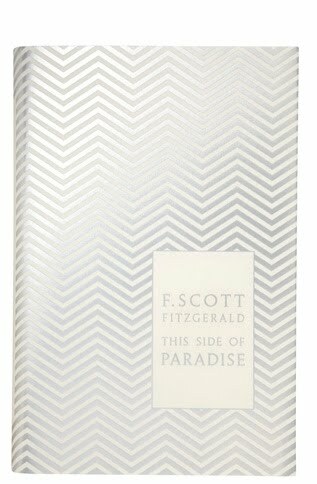 I've been working through the short stories (it is a 600-page book), and yesterday evening I finished his first published novel, 1920's This Side of Paradise. In many ways, This Side of Paradise is a typical first novel. According to the introduction (which I skimmed afterwards - I hate reading these first, mostly because they tend to assume a familiarity with the work), it does contain some directly autobiographical themes, but I probably could have guessed that anyway. Amory Blaine is the only son of a fairly wealthy family: his father is background at best, as mother and son essentially ignore him, moving around the world for the first few years of Amory's life, inhabiting a world of quiet privilege and ad-hoc education. After his mother takes ill, Amory returns to the US, lives with an aunt & uncle, and begins his formal education at an exclusive boarding school. Self-centred (& a self-proclaimed genius), he remains unpopular for several years, before finding other like-minded scholars to befriend. He also comes into a close, substitute-father relationship with a priest, Monsignor Darcy. We follow Amory through his school and then university (at Princeton) days, and on into the war and the workforce (advertising, although he consistently half-tries to write poems and stories), dropping in on his conversations with friends, classmates, teachers, girls and Darcy. Amory Blaine is not a particularly likeable character - which is reflected in how most other characters relate to him as well. Inherently snobby, solipsistic and self-dramatising, his intelligence is referred to, rather than seen. He has several love-affairs, all of which peter out for one reason or another, and few of his friendships remain strong for long - tending, instead, to be brief, all-consuming and then pushed aside for the next great influence (Monsignor Darcy remains his longest-lasting relationship). While it is very much an example of a younger writer finding his feet,This Side of Paradise is nonetheless an intriguing start to Fitzgerald's career. He conveys Amory's world perfectly (possibly because it was also his own), keeps the book moving at a steady pace despite the lack of a particularly dominant central plot, and the prose falls with the casual elegance which would come to define Fitzgerald's style as a whole. He also doesn't condemn Amory too harshly for his failings, instead recording the follies of youth with a sympathetic touch. I knew little about This Side of Paradise when I started it, but it has made me look forward to working through Fitzgerald's remaining three & a half novels.